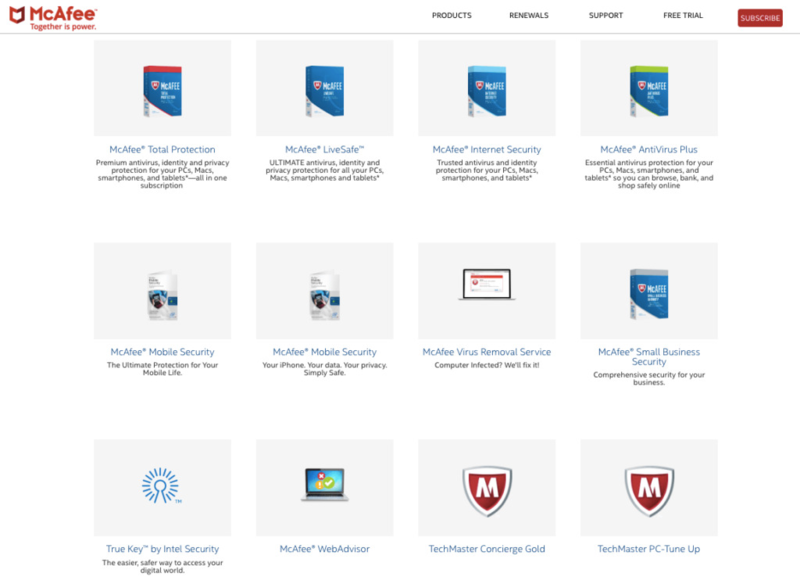 McAfee offers protection for all types of devices including Mac, iOS, Windows, & Android. An inexpensive alternative covering infinite numbers of devices. Moderate level of impact over system-performance. True-key password manager. Rapid scanning feature available. Its spam filter manages exchange, webmail accounts, & POP3. Mediocre lab results of McAfee Antivirus. A poor score of anti-phishing in our McAfee review. Limited and ineffective parental control. McAfee Antivirus products are surely one of the best protection alternatives for household users. Irrespective of the number of devices you are using, its single subscription will look after everything. To put McAfee Antivirus review in few words, it is the most reasonably priced software to keep your computer clean. McAfee Antivirus is one of the most promising “vital” Antivirus software solutions for your PC that incorporates an inbuilt firewall. Having its firm base in the USA, it emerges as a leading cyber-security company of the world. Today, McAfee Antivirus offers holistic security solutions for businesses and consumers across 120 countries. Whether you are business owners or home users, McAfee offers a wide gamut of products for you namely McAfee Antivirus, McAfee Antivirus plus, McAfee Internet security, McAfee Total Protection, and McAfee LiveSafe. The year 1987 marks the foundation of McAfee as a global security company inspired by the visionary guidance of John McAfee, its founder. It offers endless support to all its customers in terms of product education and consulting. If you are seeking for the most economical security solution for your PC, McAfee Antivirus is certainly the right choice for you, which is capable of covering every PC including iOS, Android, Windows, and Mac. You can obtain remarkable features in the Windows version of its Antivirus such as file shredder and protective firewall. This, McAfee review will help you in choosing the right alternative for your computer, mobile or tablet. When it comes to the level of protection offered by McAfee Antivirus solutions, it scores 58 percent that makes it a better option as compared to Microsoft Windows defender. It is capable of correctly identifying clean data and allows it to pass through your system. While testing the performance of McAfee, it turned up as an average alternative for the users. If you run McAfee Antivirus solution for your computer, it may slightly slow down the performance of your system. However, it is good at identifying and letting pass good data through your system, that makes it a suitable alternative for end users. McAfee, not only offers ideal Antivirus protection but also prevents your system from various harmful ransomware. It scans all your incoming emails along with their attachments to make sure that nothing dangerous or infectious comes along with it in your computer. It is also capable of automatically scanning any USB device attached to your computer. McAfee’s exciting gaming mode also suspends some useful functions for you by removing interruptions like pop-up reminders and slowed system. Thus, in terms of usability, McAfee Antivirus protection scores a perfect 100 score. McAfee Antivirus protection is the ultimate solution for both individuals and businesses. Here in our McAfee review, we’ll discuss both home and business plan of McAfee in detail to give you a clear idea how the product works. Expect a more collaborative and intelligent threat protection for your PC with a broad gamut of McAfee Products. Built and designed to provide a robust platform for cyber security to both businesses and home users. Its vast portfolio comprises products for database security, data encryption and protection, advanced analysis of the threat, network security, endpoint protection, web security, server security and security management. In our McAfee review, we will discuss some of its top-rated products which include McAfee total protection, McAfee AntiVirus Plus, McAfee Internet Security and McAfee LiveSafe. In this McAfee Antivirus review, we’re going to analyze every McAfee product to make you aware of their respective advantages as well as disadvantages. Web surfing opens your device to a number of malicious threats that essentially require your attention. In order to keep your system protected from such threats, McAfee LiveSafe offers effective security to all your PCs. Instead of limiting you to the protection of finite devices, McAfee LiveSafe is capable of covering all your devices including Android, Mac, iOS, and Windows. Its unique feature of personal locker encrypts your cloud storage, thereby making it a winner amongst its other competitors. This feature of personal locker also offers 1 GB of thoroughly encrypted online storage for you protected by a multi-layered biometric authentication. McAfee Security Scan Plus is one of the most promising free diagnostic tools available for home users. It ensures your complete protection from threats by dynamically checking your device for updated firewall, anti-virus as well as web security software. Not only this, but it also performs complete scanning of the programs opened in your device. McAfee Antivirus automatically performs the scan and provides you the alert regarding any risk to your computer along with appropriate measures to prevent it. 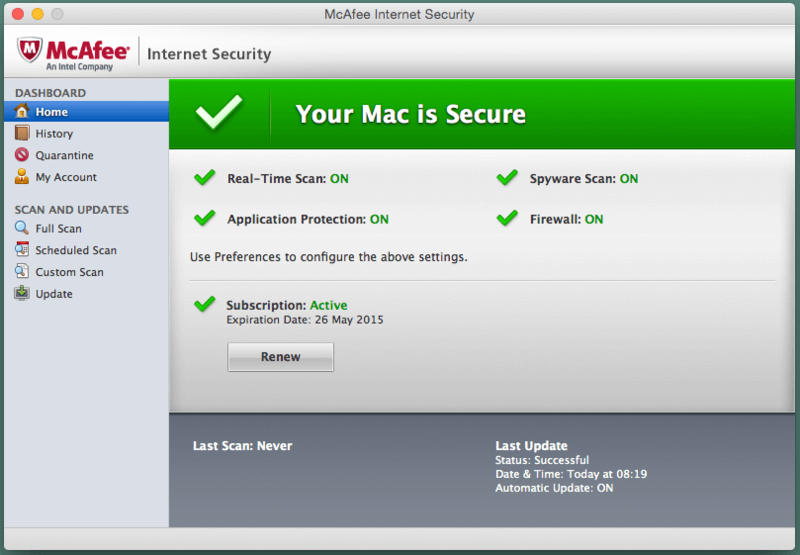 You can remain assured of your system as McAfee security scan plus works secretly in the background. Having multiple numbers of internet operating require respective security suite to ensure protection from all types of threats. If you keep on counting the number of Android, iOS, Mac and Windows devices within your household, you will get the exact count of devices that require protection. Instead of looking for separate security suite for all devices, subscribing only to McAfee Total protection will prevent all your devices. Offering well-handled parental control, hack detection, shredding and encryption features, the McAfee Total Security 2017 version is comparatively better than its previous versions. A renowned name in computer security industry, McAfee Internet Security is a feature rich protection system for all your devices. Incorporated with the major features like anti-phishing, anti malware, file shredder, parental control and password manager, it has other specific tools too for detecting malicious websites, spam emails and malware. It also provides you the flexibility of choosing the drives and folders that you want to scan and scheduling it as per your convenience. Its password protected parental control is a boon for all the parents whose children are using the internet frequently. You can easily limit your child’s time of being online. Considering the widespread usage of mobile devices by the users, McAfee mobile security is dedicated protection software offering excellent tools of privacy protection and anti-theft to you. It is capable of blocking phishing sites thereby preventing your browser from exploitation. It continuously monitors your mobile devices for threats while you are connecting with any unsecured Wi-Fi internet network. If anyone tries to snoop into your web activity, McAfee immediately disconnects your device from that network and updates you. 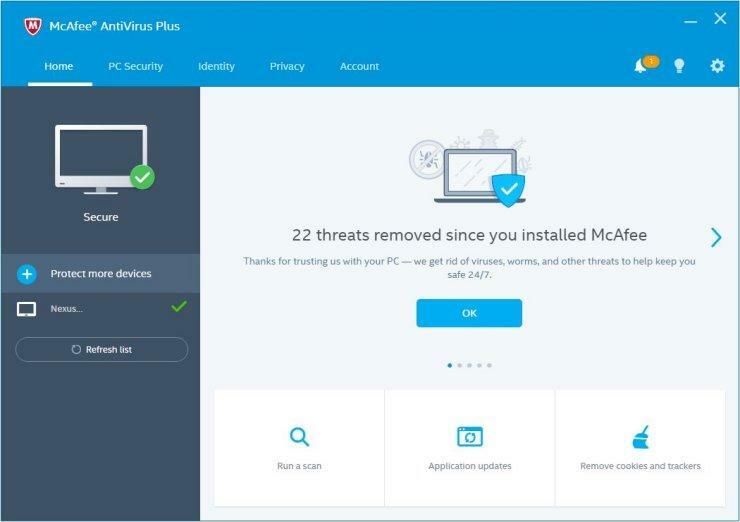 Yes, McAfee security scan plus is a distinctive diagnostic tool that is available for free to check your device for core prevention. It actively works in the background to check for the threats, web security, firewall protection and anti-virus software. It silently updates and installs your device without interrupting its productivity. If in case, it finds your computer on risk, it immediately updates you regarding it thereby providing an appropriate recommendation to resolve the risk within seconds. It not only scans your cookies and browser history but also detects Trojans, malware and other unwanted programs. It also provides you the flexibility of customizing your scan frequency as per your convenience. Not every individual is friendly with the installation of antivirus software. Keeping this factor in mind, McAfee keeps everything simple and easy. If you want to install any of the McAfee Antivirus solutions, you just need to download the respective version you want for your device. Once your download is complete, you will come across the dialogue box of McAfee Installer check asking for the software to run on your machine. The moment everything gets installed, the software will ask for your permission to “Run a scan” of your system to conduct initial scanning of the device. You need to click on the link. Next, you can further explore other options available for you. 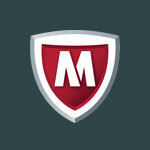 McAfee AntiVirus Plus: It is just similar to its basic program. However, its license is available for not only Mac devices, but also for iOS and Android devices including the smart watches of both platforms. Costing just $60 per year, it offers ultimate protection to unlimited devices. If you are looking for basic protection for numerous devices, this is surely a bargain offer for you. McAfee Internet Security: Add more features to your device’s security along with obtaining complete peace of mind with the subscription of McAfee internet security. You can enjoy effective parental control and anti-spam protection by just paying an annual price of $60 for a single device and $80 for unlimited devices. It also offers a license to the True Key feature of Intel with the password manager. McAfee total protection: McAfee also offers some top-shelf programs for users to remain completely secured whether online or offline. McAfee total protection is one such program that hardly costs $90 per year for unlimited devices. It also includes the licenses of 5 Intel’s True Key with enhanced feature of file encryption. McAfee LiveSafe: Another top-ranked program of McAfee is its McAfee LiveSafe that offers well-encrypted online storage of 1 GB for its users along with license of 5 true key. The minimum cost for this software that you need to pay is $90 per year for unlimited devices. Can I get McAfee free trial? If you are unable to decide which McAfee software to choose for your PC or mobile device, you can take up the free trials of such software for 30 days to explore its features and advantages in reality. This will surely lead you in making the right decision. The provision for a free trial is available for every McAfee program including McAfee Antivirus Plus, McAfee mobile security, McAfee Internet security, McAfee web protection, McAfee total protection and more. We, at Reviewsdir also recommend you to take a free trial of McAfee antivirus programs to avoid any inconvenience in the long run. However, the free trials will just provide you a gist of its features and performance. Check out the promo code on its online shopping cart. Log in to your account of McAfee. Fill in your credit card details along with billing information. McAfee antivirus software is available for both PCs and mobile devices that allow you to install over platforms like iOS, Android, Mac, and windows. Irrespective of the kind of device you are using, you can feel protected with McAfee antivirus solutions. In this McAfee Antivirus review, you will get to know its compatibility status with different platforms. Whether you use windows seven platform or windows 10, McAfee antivirus software will surely work well for you. You can use any of the top-rated McAfee solutions to prevent your PC from unwanted threats and malware. If you are looking for a feature rich protection solution, you can ideally opt for McAfee LiveSafe. Loaded with features like password managers, virus and threat protection, secured cloud storage and one subscription for all devices, it can keep your identity and data safe. If you are a user of Mac operating system, you need to install the Mac version of McAfee antivirus software. As compared to the windows version, it is less robust. The essential features that it offers include malware detection and quarantine, warnings about such apps that lack suitable certifications and download scanning. Its firewall component is also capable of enhancing your existing firewall security built in OS X. The Mac version of the software also ensures blocking access to several harmful links including phishing sites and flags that can turn out a potential danger for your search engines such as Chrome and Firefox. For all android users, making a preference for McAfee antivirus plus is surely the right alternative for ensuring full protection of your device. This software incorporates features like automatic scanning of new applications and malware scanning. It also allows you to lock your important apps with the help of PIN that can turn out useful for you if your device gets into the hands of many people. The unique feature of anti-theft protection combines lock, remote locates, alarm management and wipe via online McAfee portal. Its other additional benefits include Intel security battery optimizer, web protection, contacts back-up and handy tab for checking your security status. Though there are very few iOS malware available, you may not require any iOS antivirus solution. However, with McAfee iOS version, you also get additional benefits like back up of your contacts, location, device wiping, alarm triggering during theft, store, and copy of pictures within the McAfee secured vault. Step-by-step instructions to ensure the best usage of McAfee antivirus solutions and their respective specified elements. Virtual support from McAfee TechMaster for diagnosing virus in your device, set-up software, PC tune up and device troubleshooting. Automatically checking and troubleshooting of common issues arising in any of the McAfee products. Aiming at delivering total satisfaction to all its users, it also looks back to your feedback on their support experience. Is McAfee good to use? When it comes to judging the usability of McAfee antivirus solutions, it is very reliable. As per the recent test conducted on the usability of the software, it perfectly matches the industry standards. It offers a great user experience with a simple yet easy-to-use and navigates interface. It does not detect any legitimate software in the form of malware. Furthermore, talking about its overall performance, its scanning engines lay a moderate level of impact over the performance of your system. However, while testing its scanning performance, McAfee offered some fastest rounds of full-disk scanning when the program achieves a bead on the content of your hard drive. On an average, McAfee takes about two mins and 3 sec to scan your system quickly, looking around 3,387 files, which is not at all a bad performance. Is McAfee Antivirus safe to use? Spyware and virus protection: This feature allows you to quickly scan your complete system for detecting the virus profile by just clicking on the link. In-built with the feature of real-time scanning, it will constantly scan your device the moment you start it. Email and web protection: Almost all its antivirus software come with this in-built feature of email and web protection. Its firewall protects from hijackers who keep an eye on stealing your personal information. It also keeps a keen eye on the information sent as well as received by your device. Furthermore, it also incorporates the feature of anti-spam that works efficiently in stopping junk and spam mail from entering into your email’s inbox. True Key by Intel Security: This innovative feature offers a password manager that imports your passwords thereby storing them in a secured vault. It also allows you to apply multiple-party authentications. Parental control: If you are apprehensions about your children’s online activities, you can remain assured of their protection online with McAfee Total protection and Internet Security versions. Yes, both the software has the feature of parental control allowing you to limit the usage of internet for your children. Data protection through shredder: This is an effective tool in keeping all your sensitive information intact and safe too. You can find this feature in all McAfee Antivirus versions. You may come across a security warning to which you have to click on “yes, Continue” button. When the message of “removal complete” displays on your screen, you need to restart your system for completion of the process. In order to keep the security of your system’s valuable data intact, McAfee security scan is surely a decent alternative for you. You need not to confuse it with an antivirus. It is slightly different from the antivirus. The key purpose of McAfee Security scan is analyzing your defenses along with telling you about the vulnerability of your computer. It not only checks the status of your antivirus and firewall but also examines the objects running in your malware’s memory and web history. It is usually regarded as junkware, bloatware or crapware. It only works as a prominent tool to provide an alert of risks on your system. It is, in fact, a kind of advertising that too effective. Is McAfee real time scanning won’t stay on? Initially turn on the safe mode of your PC either with the help of F8 button or by just going to system configuration section of administrative tools. This will also turn off the McAfee real time scanner. Then, again you need to turn off the safe mode so as to bring back McAfee real time scanner working in proper condition. If you are anxious about the protection of your PC and mobile devices of your household, then ReviewsDir recommends you to opt for McAfee Antivirus software. It has something unique to offer for all end-users. Keeping your data security and privacy issues in mind, McAfee Antivirus is a one-stop solution for all your devices. It is a well-known brand offering extensive support to all types of devices. Its wide gamut of products altogether, ranging from basic solutions to fully featured, can protect your PC against the most malevolent malware. Hence, depending on your respective security and data protection requirements, you can choose from among McAfee total protection, McAfee internet security, McAfee mobile safety and more. It has been a widely used antivirus software for desktops, laptops and other devices and it indeed provides excellent protection. However, it may often slow down the performance of your system if it is an old one or has an obsolete configuration. Overall, most of the tech savvy users who are concerned with the security of your confidential data prefer using it to others. While the free versions are good to use for home systems, it is better to go for paid versions if your system is a part of a workgroup or you have a bulk of sensitive data that you would not like to get compromised at any cost. To conclude, the key factor that adds tremendous value to this malware protection software is its innovative structuring and multi-device pricing. Its True Key feature of keeping your password safe makes it the most prominent choice of users. In order to check out its efficiency and performance, you can yourself give this software a free trial and experience its features.